Man, I don't remember the last time I was this happy to see a Friday. This week has been dragging at work, and we've been busy in the evenings so I am tired! This weekend should be nice, it's supposed to rain all weekend (can't complain about that), so I hope to get a lot done around the house, run some errands, and we also want to go to a movie and try a new coffee shop in our neighborhood. (I just realized I'm officially old after typing that). This is my first time participating in the Five on Friday posts, but I always love reading them on my friends' blogs, so I thought I'd give it a try too! If you know me, it's no secret I am obsessed with Pinterest. I spend an embarrassing amount of time pinning and browsing. My friend even made me in charge of pinning for her upcoming wedding because she knows I spend so much time on there! I'm even a guest pinner on her wedding board, it's fun! So, in honor of my love for Pinterest, I thought I'd share my 5 favorite pins from this week. Be sure to follow me on Pinterest to keep up with my pinning habit! It seems like the majority of my pins on my style board are of Kendi @ Kendi Everyday. She is just so adorable, I absolutely love her style. She seems like such a genuine person you'd want to be best friends with, which makes her all the more lovable! 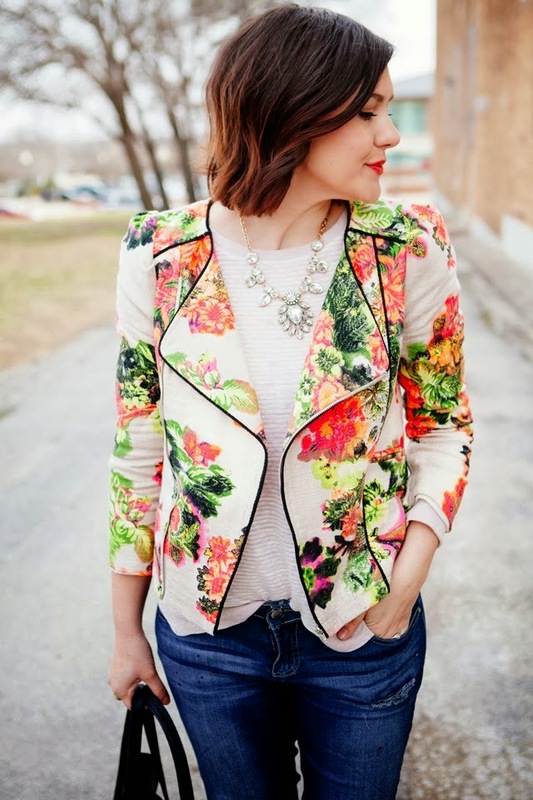 I'm just obsessing over this floral blazer, I wish I lived in Texas and could shop at Bloom. I don't know if it's the gloomy weather or what, but I haven't been able to stop thinking about Spring and this cheerful blazer. I just love vintage feel of that floral print, and the black piping is perfection. And I love how she styled it with that necklace and denim. Lately, I've had a major soup craving. All I want is a hot bowl of soup paired with some crusty bread for dipping. It's the perfect comfort food for cold, rainy days like today. 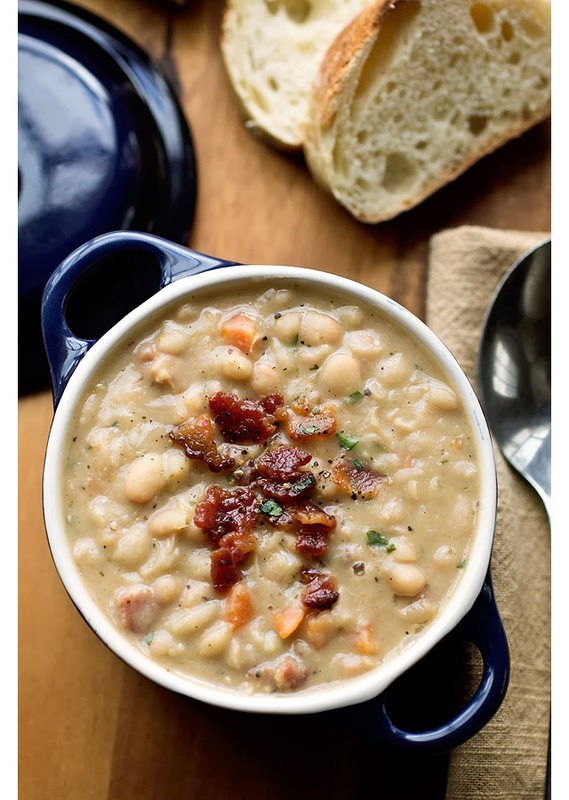 I love white bean soups and chili, and this White Bean Stew from Erin @ Vale Design sounds incredible! I think I'll be making a batch over the weekend. I mean, anything topped with bacon has to be amazing, right? 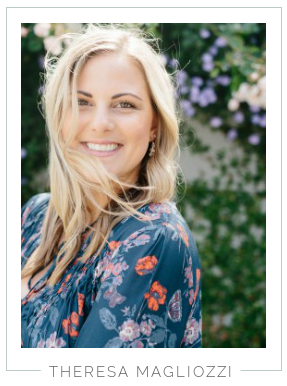 My girlfriends and I are planning our friends Bachelorette Party in Palm Springs for later this year, and we've been busy pinning party ideas, themes, and activities for this epic girls weekend. I cannot wait! When I saw this adorable, retro floral bikini it screamed Palm Springs to me! We'll be renting a house for the weekend and words can't describe how awesome it is! It's going to be amazing! We'll be spending hours poolside with cocktails in hand, and a retro bikini just seems fitting for a place like Palm Springs! Maybe we'll even do a little retro/theme photo shoot with the bride and all her best girls! Half Baked Harvest is quickly becoming my favorite food blog, her recipes are ridiculously amazing. Full of unique flavor combinations I can't wait to try for myself. I shared this recipe for Chipotle Quinoa Sweet Potato Tacos on my Facebook Page, but it deserves another spotlight. I've made these tacos twice now, and I'm already thinking about the next time I get to eat them. They're THAT good. Seriously you guys, try them! If Kendi is filling up my style board, Tieghan is quickly becoming the spotlight of my eats board. I love 7th house on the left, I feel like their style matches so well with mine, and I always get the best decor ideas and decorating inspiration from reading their blog. My kitchen is the one place in my house I don't love (read more here). While the vintage tile is charming, it just feels dated and dirty. I've been dying to do a makeover in there since I moved in, and I need to finally just bite the bullet and get started. There are a few simple changes I'd like to make, starting with a can of paint (we rent, so I can't get too crazy). The other thing I want to do is create some open shelving on the large blank wall. Not only for added storage, but to create some visual interest to an otherwise boring space. 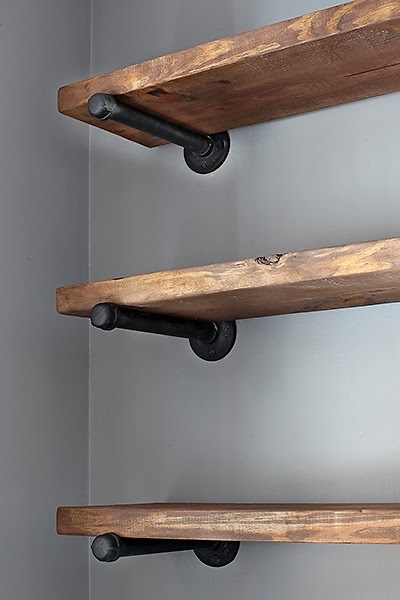 I love the rustic feel of these shelves, and I feel like it's a doable project for Andrew and I. What do you think? This Five on Friday thing is fun! I think it might become a weekly feature, what do you think? i'm absolutely in love with those shelves. i need them…yesterday. thanks for sharing that blog! i'm off to look at it now. i have aubrey designing my blog right now…it's almost finished! love your blog it's beautiful. found you via the linkup. new reader! I love the shelves... so simple and full of character. And welcome to the link-up...Glad to be a new reader and follower. Come visit us as well! :) :) happy friday to ya. Kendi is probably my favorite fashion blogger ever. I've been following her for years now, and my style envy just keeps growing! 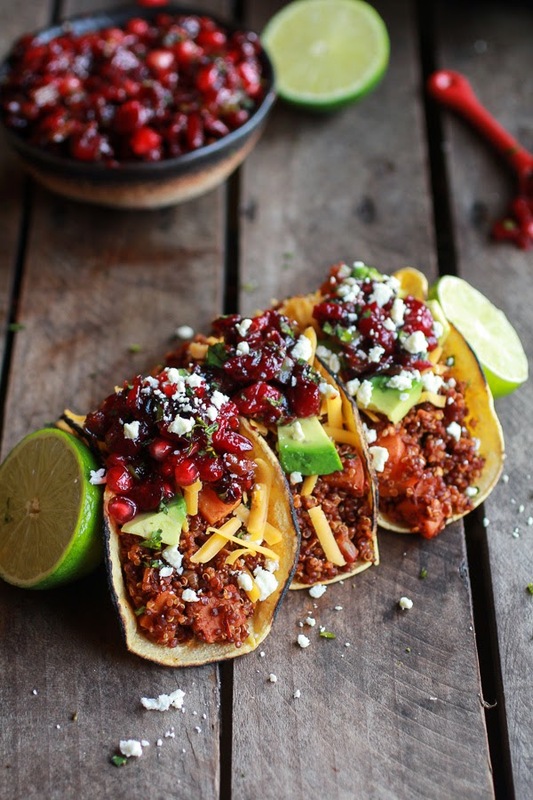 Just pinned both of these recipes....those tacos look SO good!! I can't wait to try them. those shelves are perfect. I want them in my home. Found your blog through the linkup! Love those shelves...so cool! Also noticed you were from SF- one of my favorite cities..and have family there too which makes it nice :) new reader! Have a great weekend!! Started following on Pinterest! Have you used Viral Tag for scheduling pins?! I am OBSESSED with it!